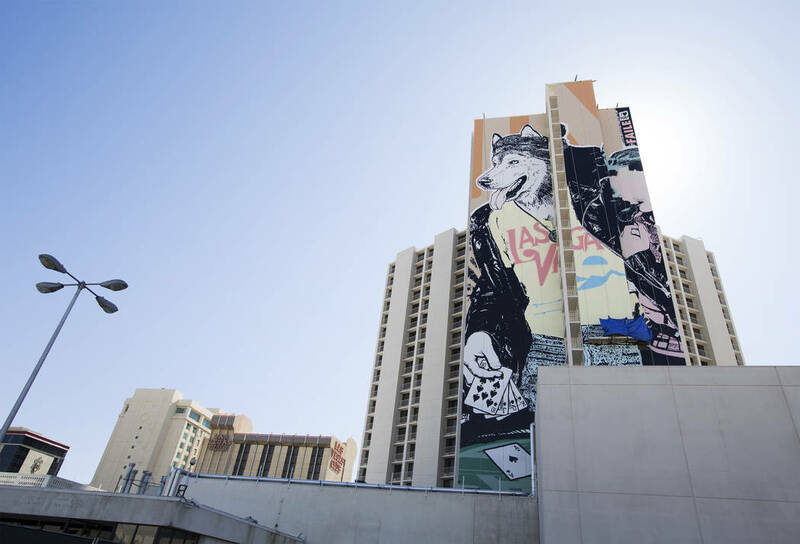 The installation by Faile might be the most prominently positioned mural on The Plaza Hotel & Casino north tower because it will overlook the busy I-15 freeway and have about 200,000 cars driving past it every day. 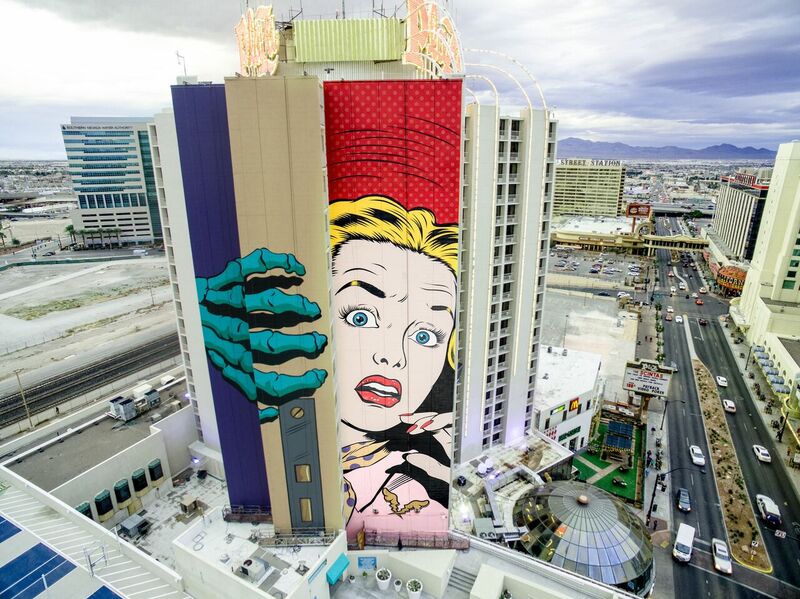 The mural is sure to make The Plaza stand out amongst the rest of the downtown hotels and casinos. Jonathon Jossel, CEO of the Plaza, felt that it was a vital part of downtown Las Vegas culture to have a diversified art installation available for the public to see. What makes the murals at The Plaza especially unique is that you don’t even have to go inside to view them. They will attract your attention from the freeway or while you are walking towards downtown. Jossel says he is proud to have the murals call The Plaza their home.Patrick McNeil of Faile stated that when they were offered the opportunity to paint The Plaza, they thought of the famous painting of Dogs Playing Poker by Cassius Marcellus Coolidge, which can be reflected in the mural which in its progress appears to be a dog holding a hand of cards. McNeil also said he was thrilled to be a part of the iconic history of The Plaza, which has been a central hub for artists and art lovers of all kind.Click here to view Plaza’s First 21-Story Mural (by Shepard Fairey).Click here to view Plaza’s Second 21 Story Mural (by D*Face). Having formed their band in Las Vegas, The Killers are well known in the Las Vegas music scene for their iconic rock sound and Vegas subject manner. Their new album being released on September 22, 2017, “Wonderful Wonderful” brings Plaza Hotel & Casino into the spotlight with them. This will be The Killers’ fifth album and it’s already looking like it will be a great success. The music video for the first single off the album is “The Man” and it was filmed almost exclusively at The Plaza. The video features shots of The Plaza lights and valet, as well as the showroom and casino. The Killers were formed in Las Vegas in 2001 and are familiar with the downtown Las Vegas scene. They even played as headliners at the first Life Is Beautiful festival in 2013.Since The Plaza has been a staple of downtown Las Vegas since the 1970’s, it was an obvious location choice for The Killers to film a music video with a classic old Vegas feel to it. In the beginning of the video you can see the camera panning to the entrance of The Plaza where you will see the hotel’s marquee letters and valet drive up.The whole music video is an ode to Las Vegas living. Classic scenes of Las Vegas are pictured throughout the video like members of the band having fun gambling in The Plaza Hotel & Casino and Brandon Flowers singing on stage surrounded by beautiful Las Vegas showgirls in The Plaza Showroom.